Huntington Beach is represented by the pier extending into the blue water. 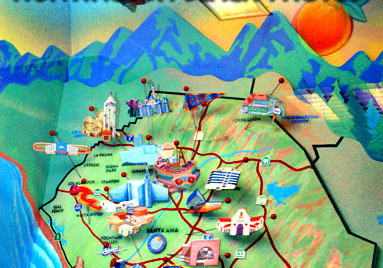 Pictured above is the graphic relief that appears in a large glass display case at the California State Capitol building in Sacramento, California. 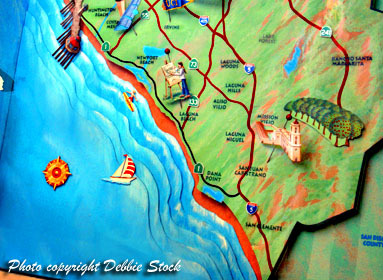 Orange County is one of 58 counties in California, each represented with individual display cases showcasing each county's assets or highlights. Huntington Beach is one of 478 cities incorporated in California and one of 34 cities located in Orange County. California cities with beaches located at the Pacific Ocean include approximately 118 beach locations and do not include cities with beaches at lakes. A trip from Huntington Beach to the California State Capitol is highly recommended. Tours are available with free admission. Direct air flights from Orange County Airport (SNA) to Sacramento Airport take less than two hours and driving time with stops takes approximately 10 to 12 hours. When you arrive in Sacramento, a Super Shuttle ride into the city costs around $15, though a city bus for those with easy to carry on luggage can cost around $1.50 one way. The nicest hotel directly across the street from the Capitol building. Don't be surprised to see elected officials from Huntington Beach at the hotel. Assemblyman Tom Harman - California State Assembly Republican, Assembly District 67, was seen at the hotel, a favored location for overnight accommodations. There are approximately 10 other budget and nice hotels within walking distance of the California State Capitol and Old Town Sacramento.